Late news to Gameweek 10 caught many managers by surprise when Poch informed fantasy managers that Harry Kane would miss the Man United fixture. This compounded by the “Pep-Go-Round” at Man City, it appears there are no guarantees in fantasy football. Then again, I think we all knew this going in, but play with fingers crossed every time we set out starting XI. This week I took a comment that Dave from Burnley posted on Twitter and started Kane. Wise or not, it was worth the gamble, even though Kane sat out the entire match. We now wait to see where the the forward is come midweek and their UCL against Real Madrid. This could provide an indication of him being fit to face Crystal Palace. His replacement, Stephen Ward picked up 6 points with a CS against Newcastle on Monday. 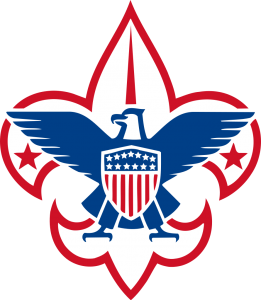 Nothing ventured, nothing gained. As for Gameweek 10, I went into Saturday with a -4 points, bringing in Richarlison as the second part of a 4-player swap that included Ben Davies and Jack Cork. In the end, I netted 4 points, which I look upon as a positive, especially with Davies role a bit in question with the return of Danny Rose. This was also my first hit of the season, something I really want to minimize this season after posting 39 negative hits (-156 points) last season. While Richarlison blanked on the week, he’s proven with worth with returns in the last 4 out of 5 games and good run of fixtures upcoming; ee/WHM/new. It’s hard to be too surprised at Pascal Groß and his involvement with Brighton as he created a league high 95 chances last season in the Bundesliga for Ingolstadt. Brighton have score 10 goals this season of which Groß has been involved in 7 of them (2 goals / 5 assists). He continued with consistency in GW10 providing his third assists in the last 3 games and picking up 2 bonus points for a total of 7 points in the 1-1 draw with So’ton. Unfortuantely, Christian Eriksen didn’t fair as well, playing a deeper role, as we saw against Liverpool, Eriksen didn’t provide much of a spark for the Kane-less Spurs. That’s back to back blanks for Eriksen as Spurs face Palace this weekend. Intentions are to hold Eriksen as after GW12 and a visit to Arsenal, Spurs have a great run of fixtures; WBA/lei/wat/STO/BHA. While Kane was included in the starting XI, I knew it was nothing more than a place holder. Partnering up front was Jesus and Jamie Vardy, while jury was out on Jesus and his minutes, it was a matter time before Vardy broke duck and scored. Jesus disappointed, nearly non-existent at times, as Aguero watched from the bench, but he didn’t gain any foothold with a disappointing 1 point performance. Vardy of the other hand, got on the board early with a goal, finishing with 8 points, his first return in 4 weeks. As it has been much of the season, my score was bolstered by the 5-man defense, which continues to pay dividends. While not the most popular formation to run out, this was another example of attacking returns combined with clean sheets that pulled my gameweek from the doldrums. Lead by Sead Kolasinac, a goal, assist and 3 bonus points he finished the day on 14 points leading all scorers. This was his first attacking returns since GW4, while he was on my shortlist, I am reconsidering him but he’s got a tough run of fixtures; mci/TOT/bur/HUD/MNU. New boy, Stephen Ward, as mentioned earlier picked up 6 points on a CS and Marcos Alonso might have bought himself another week providing a his third CS on the season, first in 5 gameweeks. At £6.9m, his not performing up to his price with just 2 goals, no assists and 3 clean sheets, Chelsea have Man United this week and Liverpool in GW13 and Arsenal in 22, aside from that it’s a sea of green. Might be too hard to ignore moving forward. Aaron Cresswell nearly gave way this week for Davies, but was saved for a few more games, as Davies was no longer a reliable starter. While Cresswell does face Liverpool at home in GW11, he picked up his first assist of the season in just 45 minutes of work. Not sure if only 45 minutes of action is a cause for concern as he was substituted at halftime in favor of Arthur Masuaku. Cresswell leads all defenders with 72 crosses on the season with 12 chances created equating to 57 minutes per chance. Not quite sure what is going on defensively for Man City, 2 goals to Stoke City and 2 goals to WBA, in two of the last three games might not be a cause for concern for the offensive juggernaut, but fantasy manager expectations are set higher. Both these matches should have been clean sheets, but left mangers scratching their heads. Kyle Walker has returned 7 weeks in a row! With 4 assists and 5 clean sheets Walker has scored 42 points. I am looking past his on goal in GW8, which negated his assist points. Yet City have a favorable run and Walker is a cornerstone in my current defensive minded formation. On the week I finished with 52 points (after the -4 hit) and 6 points above the weekly average of 46. It was a green arrow moving up 175k spots to 954k. 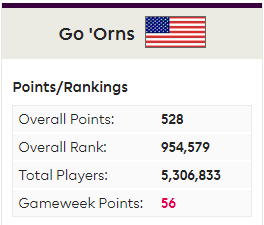 It’s now 3 greens in the last 4 weeks, but still playing catch up to my best rank on the season in GW8 at 634k. The most frustrating part of this FPL season has been the poor captaincy output, scoring just 66 points (12.5% of overall score) on the season. 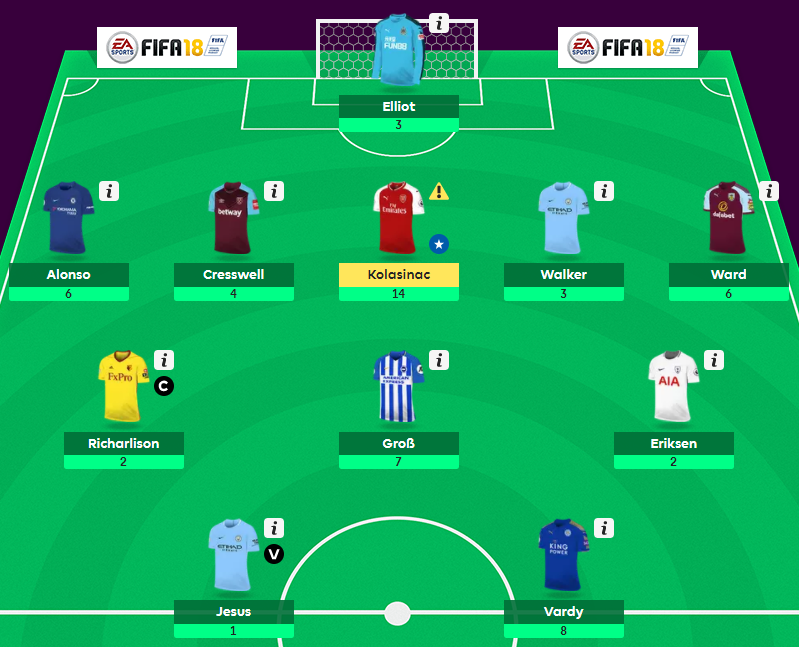 GW7 and GW9 are the only weeks I scored double digit returns (26,10). This lack of points has resulted in my squad been stuck in a virtual quagmire around the million mark. Just 10 points a week over 10 gameweeks, totaling 100 points would put me just inside the top 5000! That’s how frustrating its been to start this fantasy season. Interesting to note that one of my goals for the season was to average 60 pts/week. When I have been able to start a 5-2-3 formation, I have averaged 59.3 points. Unfortunately due to Pep, injuries and benched players only 4 games have finished with a 5-2-3. The 4-4-3, using Jack Stephens (automatic sub) off the bench in lieu of a fifth defender has produced just 47.5 points over the a 4-game period. 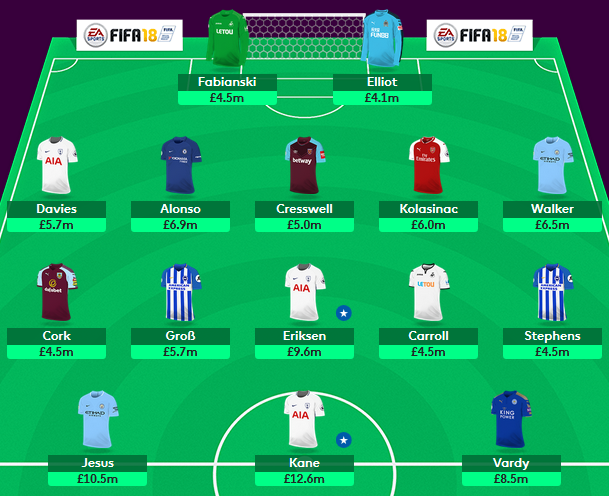 GW10 was just the second time running out a 5-3-2, which is currently averaging 53.5 points. Looking ahead, the 5-2-3 (or 5-3-2) seems to be losing its potential, as forwards are struggling. At City Jesus and Aguero appear to be in rotation, Kane is injured, Morata, still returning to full fitness hasn’t been impressive the last 2 games, while Lukaku has no goals in his last 3 (but does have 3 assists). The “power 3” seem to be losing favor as fantasy managers look to stacking the midfield. As I wrote yesterday in FPL: 4-5-1 Viability?, could this be the next iteration in my fantasy formation? Running a few different scenarios I have been able to put forth a competitive 4-5-1 and 5-4-1 formation with Harry Kane leading the attack. However, Romelu Lukaku might be a stronger candidate, based solely on his consistency. While Kane has proven himself at Wembley in GW9 with a 16 point haul, giving him 4 double digit hauls on the season his consistency has yet to be seen. However, I feel Kane is more explosive than Lukaku. Currently Kane sits a single point ahead of the Belgian. Risk with a lone forward could be high, but running out the likes of Eriksen, Salah and Hazard could reap huge rewards with budget midfielder Groß and Richarlison seemingly hitting stride and putting together fantasy points and consistency. Defensively, this squad mixes attacking defenders, Walker, Kolasinac and Cresswell with clean sheet viability in Ward and Jones. Only concern would be the lack of forwards on the bench with Oumar Niasse and Mama Biram Diouf. Niasse has been a part time player for the struggling Everton, while Diouf has 3 goals on the season but does play all 90 minutes. It was another weekend that didn’t allow me the luxury of watching any EPL games. Maybe that was a blessing in disguise, as overall scores appeared way down. I still laugh at all those managers who knee jerked, bringing in Aguero to over the nicked, Harry Kane. Talk about a tragic failure! Then captain him to boot! Double whammy! Thankfully, I kept faith in Harry, using an last minute idea from, Dave from Burnley. I started Kane, just on the off chance he made a short cameo. We know that didn’t happen, but will be pleased to get some points off the bench. Moving forward it appears the balance of power has swung in support of the midfielders. Gone are the early days of the “power three” or “big 3 forwards” to anchor your fantasy team. We have seen more midfielders coming into form, as well as some budget performers who’s consistency is starting to pay off. Of course, the week I bring Richarlison in, he blanks. Damn! Did I mention I love this game? So what is a fantasy manager running a 5-3-2 formation supposed to do? 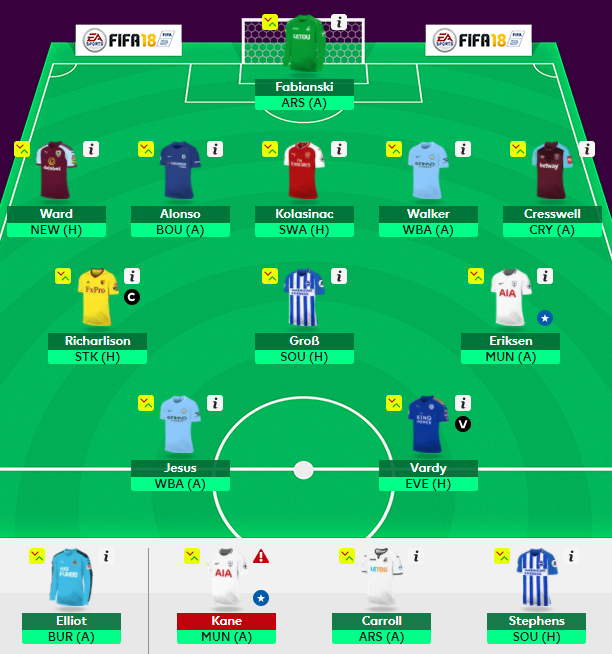 I mauled the idea over 2 weeks ago and instead of making changes to my squad I activated the Free Hit Chip, which resulted in a season low score of 36 points. Not what I was expecting. This week I took my first -4 point hit, moving Jack Cork for Richarlison. This move was the second part of two transfers, which saw Ben Davies out for Stephen Ward in. Going forward I believe Burnley has a great run of fixtures and Ward has been a pleasant surprise this season. The addition of Richarlison had my starting XI line up as a 5-2-3, first time I have used that formation this season. As of Monday, before Burnley hosting Newcastle I have scored 47 overall points with Rob Elliot and Stephen Ward to play. This as the weekly average is just 39 points! Unfortunately, the injury to Kane is a cause for concern. Left out this week against the loss to Man United, Spurs looked toothless up front with Son, as Eriksen was relegated to a deeper midfield position. Hopefully the midweek UCL fixture against Real Madrid will shed light on his availability, home to Crystal Palace in GW11. With very few forwards “in form” I was considering moving Jesus and Vardy for budget options. Names such as Abraham and Diouf were top of the list. Not sure I want to consider Glenn Murray, who’s three goals in the last 2 games has fantasy managers looking at his potential. He’s the third most transferred in forward for the week before the aforementioned Abraham and Diouf. Using these three forward would cost me £23.8m, leaving me £17.1m to spend in the midfield. It’s not uncommon to play five midfielders, as the 3-5-2 is a rather “common” formation for many FPL managers. However, combine that with 4 defenders and a lone striker, it could be a risk many are unwilling to take. So far this season we have seen little consistency in the forward position, outside of Romelu Lukaku. While he’s not setting the net on fire, his 62 points are third best this season, just one point behind Harry Kane and 9 behind Leroy Sane’s total of 71 points. While I still feel Kane is more dynamic, offering a better chance of “big returns” it has been Lukaku who’s returned 8 out of 10 games this season. 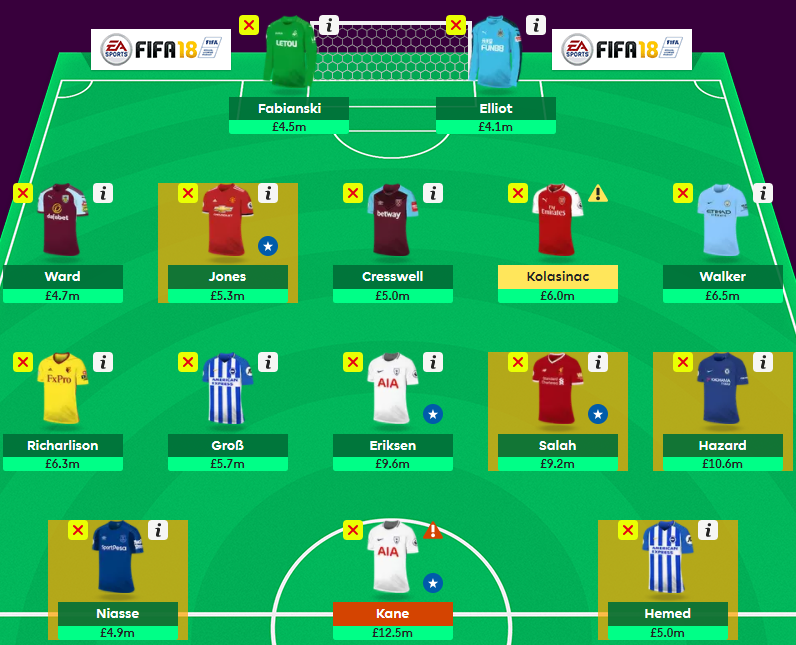 Currently I feature Christian Eriksen, Pascal Groß and Richarlison as my 3-man midfield. 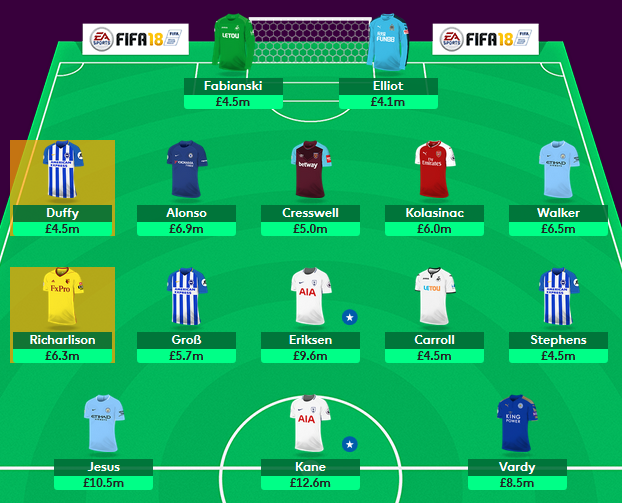 With a stout, 5-man defense I have some hefty funds wrapped up in Marcos Alonso (£6.9) and Sead Kolasinac (£6.0). With his 14-point performance on Saturday, I am inclined to hold Kolasinac, which leaves Alonso, the fall guy to free up the necessary budget to build my 5-man midfielder. The short list includes Eden Hazard. At 5.2% owned, his leadership and potential could be a BIG differential if his GW10 performance is any indication of his upcoming returns, as he recorded his first double digit (11 points) return of the season. At £10.6 he isn’t cheap, could fit into my 4-5-1 plans. Liverpool has a run of good fixtures upcoming having just CHE in GW13 and ars in GW19, it’s all green for the Reds through Christmas. While I haven’t been a big Mo Salah fan, he’s been on of the best midfielders through 10 weeks. At £9.2, his 57 points trail those of Eriksen and Sane but has returned just once in the last 4 weeks. Bringing Salah and Hazard in together is possible, but unlikely as I would have to move Alonso. Even though he hasn’t produced I am not sure I am completely comfortable with that. Other options would see Alonso being moved for Harry Maguire (£5.1m). We know Claude Puel take a defensive minded approach to his game plan and Maguire could benefit even home to Man City in GW12 and Spurs in GW14. This would free up enough budget to allow Raheem Sterling and Eden Hazard to round out my starting XI. While Sterling isn’t my first choice from Man City, I would need to free up another £0.3m in order to secure David Silva. Without downgrading Kolasinac or Kyle Walker, I would need to make due with Sterling and the “Pep Carousel” until I further notice. I am keeping a close eye on Riyad Mahrez as well, a goal and 3 assists in his last 3 games, now playing in a more supporting roll for Jamie Vardy up front. Regardless of the players that are transferred in, this plan will take a few weeks to implement, as I don’t intend of taking a big hit to bring them all in. I won’t be opposed to take a few more 4-point hits to expedite things in order to strengthen my midfield. For example, Hazard in GW12 against West Brom with an away fixture to Liverpool the following week. Sterling can wait until GW12, as City hosts Arsenal this coming weekend. And with Pep at the controls, who the hell knows if he will even start! It’s been a very long week leading up to GW10, especially coming off a below average GW9 overall score of 36 points. Knowing I made a poor decision in NOT captaining Kane, opting for Jesus. No longer do I hold faith in Pep, his rotation or any potential captain options that City carry. With that, here’s what my starting XI look like for the upcoming gameweek. As seen in my starting XI, Harry Kane will not feature this weekend, however unlike the 500k+ managers who have shipped him for Kun Aguero I have decided not to take a hit to bring in the Argentine. Jesus and Vardy were already slotted to start this weekend. I don’t feel the need to start a 3-man forward line two favorable fixtures in WBA and EVE respectively. It’s been a week long tussle, following a few different fantasy sites, as well as Twitter, in an attempt to make a decision on how to move forward. The Free Hit Chip I played last week, left me with the same problem I faced last weekend. Even with the injury to Kane, I would not have moved for a new forward as a temporarily fill in. 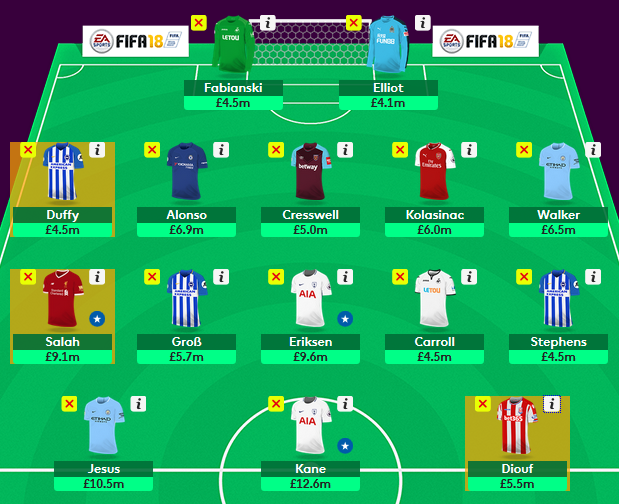 Yesterday afternoon I decided to make the change dropping Ben Davies and Jack Cork, taking a -4 point hit and introducing Stephen Ward and Richarlison. Initially, I was looking at Shane Duffy as a replacement for Davies, but he would have been a 3-week replacement before Brighton fixtures become unfavorable. Burnley, on the other hand appears to have a great run through GW18, only having to face Arsenal in GW13. This was also the week I transferred in Richarlison as I look to transition to possibly playing a 5-3-2, which is what formation I will start this weekend. Looking further out, my plans were to attempt a 4-5-1, with Kane holding court as the lone forward, but packing the team with three premium midfielders. More on that next week. As for the 3-man midfield, the in form Richarlison immediately makes his first start for my squad accompanied by Pascal Groß and Christian Eriksen. Last week Groß picked up his 4th assist on the season, while Eriksen failed to return in a 4-1 thrashing of Liverpool. Hopefully we see him in that advanced role this weekend with Son or Llorente playing the advanced role in place of Kane. Both players will continue to feature in my starting XI. 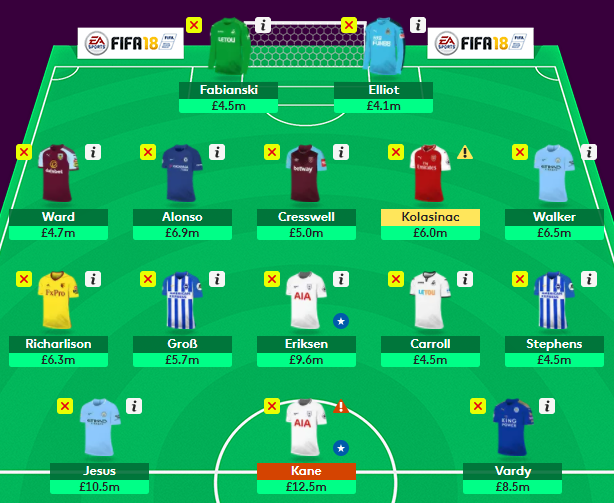 The addition of Richarlison now provides another captain option for GW10. Currently the armband is his, but Jesus could push for it, but after last weekend’s rotation debacle, I am not really inclined to be burned two weekends in a row. Defensively, my formation was to be a 4-3-3, but Kane has pushed Aaron Cresswell back into service this weekend and I will feature a 5-man defensive unit as I continue to promote this formation. He will be joined by new boy, Ward, Marcos Alonso, Sead Kolasinac and Kyle Walker. Alonso draws what could be fine start in my squad. Unhappy with his involvement, coupled with no offensive returns since GW2 and Chelsea’s failure to keep a CS in the last 4 gameweeks, his £6.9 price tag is now becoming more of a hindrance. His away fixture to Bournemouth will seal his fate, one way or the other. Between the sticks, Rob Elliot returns to the starting XI away to Burnley. Kolasinac is the other question mark. Playing a weak Swansea squad that could struggle down the left of the pitch, he and Sanchez could feature big this weekend at the Emirates. However, I am not holding my breath, as he’s recorded just 2 assists this season, the last in GW4 but Arsenal have kept clean sheets in the last 4 out of 6 games. Like Alonso, he’s get one week to prove with worth or else he’s destined to me moved as well. Kyle Walker is secure in his starting spot, continuing to return CS with 6 out of the last 7, unfortunately his assist 2 weeks ago came with an own goal, but as prolific as City has been on the attack, I look for Walker to continue to produce at both ends of the pitch. Aaron Cresswell sees the pitch again, thanks in part to Kane being out. While he hasn’t been successful yet, he’s averaging a cross every 9.1 minutes, that’s tops in the league! Up against a Palace squad that has scored just once this season, the Hammers have a chance to keep it clean this weekend maybe see some attacking returns. After last weekend’s 54 point showing I can see the top spot drawing nearer, just 32 points off the pace. 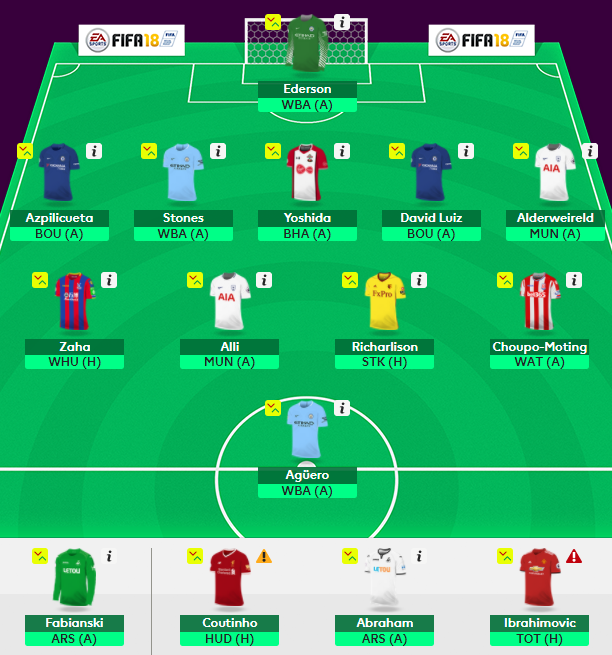 This week I made just two transfers, bringing Maya Yoshida back into my starting XI and securing the services of Zlatan Ibrahimovic, for later in the season. Could be a bit of a punt, but would rather retain his services and fill a forward slot that miss out on the potential he could carry come January (or earlier)! For the short term, he’s useless to me. Defensively, I will say what I said last weekend, the defense is primed for a full slate of clean sheets. The Chelsea duo of Caesar Azpilicueta and David Luiz are always full of potential, as Bournemouth hasn’t been all that effective offensively. John Stones is my lone City asset, who continues to see pitch time with the Vincent Kompany injury. Toby Alderweireld faces a tough challenge in Man United, who’s assets continue to struggle, which could lead to this game ending in a 0-0 draw. Finally Yoshida and So’ton draw an away fixture at Brighton. Again, not know as a strong offensive squad, this match could end 0-0 as well. I double up with Man City’s Ederson in goal. The midfield is unchanged for the first time this season. Dele Alli could be on the verge of a break out after a goal last weekend and midweek in the English League Cup. He faces a struggling Man United, who will be looking to park the bus against Spurs. Two young and in form players in Richarlison and Chuopo-Moting will face off against each other at the Bet365, hopefully this will be a high scoring affair. Finally, I am still backing Wilfried Zaha, playing OOP for Palace entertain West Ham. Due to injury and a 50% chance of playing I placed Coutinho on the bench. Up front, I am going with a lone striker in Kun Aguero in a 4-5-1 formation. I am not fond of Tammy Abraham but Swansea does have a mix of fixtures, he will retain a spot on the bench for this weekend. First off the bench is Coutinho, just on the off chance he plays, but there could be some question of Aguero’s starting spot after playing 120 minutes midweek. This could mean that Abraham will feature in this weekend’s action away to Arsenal. As I eluded to yesterday in Premier League: What next?, it appears FPL is at a crossroad in the season. The budget midfielder is now on the rise, coupled with the fall of the premium wing back, fantasy managers appear to be shifting their players to take advantage. Using a 5-2-3 formation, it could potentially take me 3-4 weeks to right the ship, shuffling players in order to get a viable 4 or 5 man midfield. 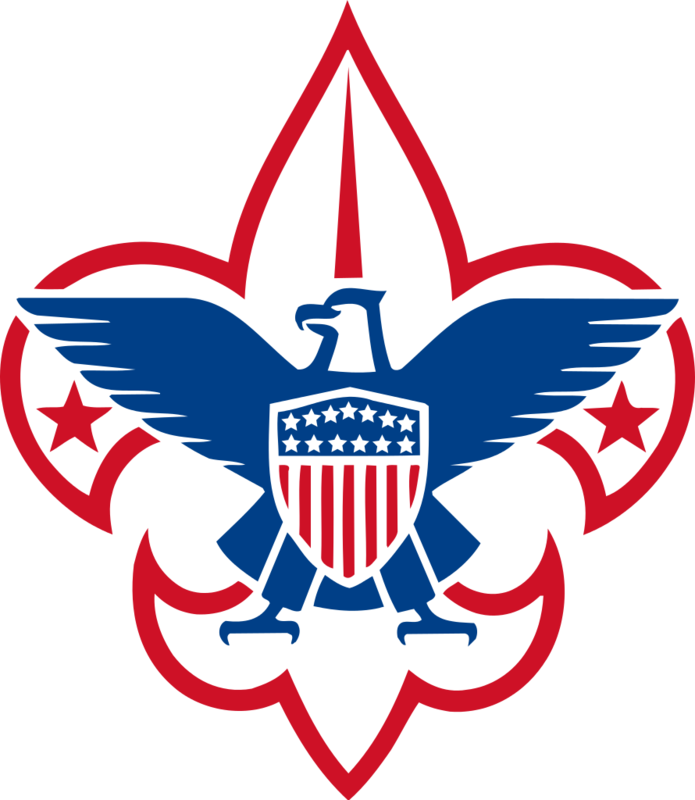 Sure, it could be resolved with a single swoop taking a big hit, but not sure that is the answer to my conundrum. After further evaluation, I am considering my first hit of the season to take advantage of a potentially “hot” player. While I tabbed Richarlison as an in form, budget midfielder it would require a -4 point hit, coupled with the transfer out of Ben Davies and Jack Cork to introduced the Brazilian and a £4.5 defender, most likely Shane Duffy. However, could it be more worth my investment to take a -8, introduce Mo Salah at £9.1 for a 3-man midfield, shifting my formation to 5-3-2. It would still require the transfer of Davis, as well as Jamie Vardy to free up the necessary budget to fund the move. In place of Vardy I would go with Mama Biram Diouf and a £4.5 defender. The problem with this move, it would shift my formation to a 5-3-2 and I would not benefit from any points scored by Diouf, which could potentially help offset the -8 point hit to bring in 3 new players. The alternative, start with a 4-3-3, take advantage of the Diouf transfer and sit Duffy or Cresswell, both have good fixtures this week. Salah would be along term acquisition with great potential, as we have seen early in this EPL season. Diouf would become my “budget” forward with potential, but based on formation wouldn’t be penciled in to my starting XI. Duffy would be a 3-week player, as Brighton’s fixtures get tough starting GW13. This shift in formation would also leave me £0.8 in ITB to be used elsewhere. The final option of the weekend, sit tight, breath deep and leave my squad alone. Take the chance that Davis starts and Spurs can keep a CS against a struggling Man United. 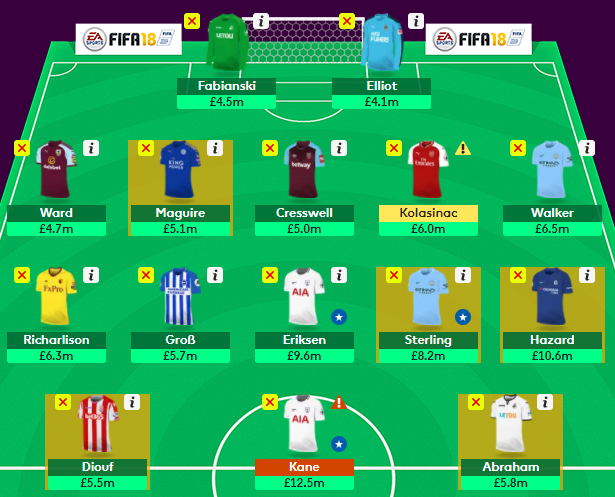 By banking the FT, it would allow me multiple moves ahead of GW11, at which time I would address concerns I have with my starting XI moving forward. At this point in time, I have more concerns than I do transfers and getting in on hot players may require a small step back, in terms of minus points to gain points in order to start climbing the OR after a subpar performance in GW9, season low 36 points.